That Blue Jeans Guy : Add "Movie Star" to the List of Cassandra Kubinski's Accomplishments! Add "Movie Star" to the List of Cassandra Kubinski's Accomplishments! I'm so excited to forward this information to all of my blog readers. This musical has a great feel to it, and I know in advance it will be good. Both Cassandra Kubinski and Brother Love have had music played on my show many different times, and if I can get permission to play the music in my show, I'll feature something on a future episode. In the meantime, please support this movie in whatever way you can. I'm thrilled to announce that tickets are officially on sale for the world premiere of CLEAR BLUE TUESDAY, the rock movie/musical I worked on for the better part of 2007. I play Sam in the film, co-wrote the screenplay, and wrote 2 of the songs. The press release is below. I hope to see all my New York family, friends, and fans at the premiere, and hope that all who are not in the NYC area will visit ClearBlueTuesday.com to sign up for updates as to further screenings and DVD release. There has been some talk of a CT group coming down together- email me back within a week if you're interested in this option, and I'll try to connect everyone in CT who might want to carpool. Meanwhile, if you have a Facebook, Twitter, or Myspace page and can post the above link in your status with a note to your friends to check out the mini trailers and info on the film, that would be amazing as we begin building the buzz around this project! Thanks in advance for helping out. Finally, big thanks and love to everyone who has been so interested (and patient) in the film's development and release! Now it's time to CELEBRATE the final product. You are invited to the World Premiere of the musical movie CLEAR BLUE TUESDAY, premiering as part of the New York Musical Theatre Festival! The New York Musical Theatre Festival will proudly present the World Premiere of Clear Blue Tuesday, a musical movie by Elizabeth Lucas on Thursday, September 10 at both 7pm and 9:15pm. The screenings will take place at the School of Visual Arts (SVA) Theatre (333 West 23rd Street between 8th and 9th Avenues). Tickets for this World Premiere are $20 including a post-screening Q&A and will go on sale Saturday, August 15 at www.NYMF.org or by calling 212-352-3101. Eleven New Yorkers change course after catastrophic events force them to examine why they moved to New York and to decide whether they'll stay. 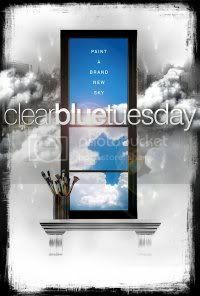 Clear Blue Tuesday follows their lives over the course of six years, each year on a Tuesday in September, as they pursue the dreams that drew them to the city. Combining original songs with an unconventional narrative style, Clear Blue Tuesday was developed by an ensemble of eleven New York actor-singer-songwriters through an extended rehearsal process with director Elizabeth Lucas. Using personal journeys and improvisation as a springboard for developing characters and narrative, the cast wrote the songs they sing. The resulting stories and songs are both fictional and intensely personal, exploring the difference between the goals we pursue and what makes us happy and how the expanding gap between the two becomes more visible against the backdrop of catastrophic world events. The principal cast includes Asa Somers, Becca Ayers, Brother Love, Cassandra Kubinski, Erin Hill, Greg Naughton, Jan O'Dell, Jeremy Schonfeld, Julie Danao-Salkin, Robert Hager, Vedant Gokhale. The film also features Al Parinello, Chris Anderson, Chris Orbach, Christian Campbell, Christopher J. Hanke, Hollis Scarborough, James Naughton, Julia Murney, Kelli O'Hara, Marsha Lawson, Mary Ellen Ashley, Patricia Mikes, Ramona Keller, and Samantha Stockwell. NYMF is the flagship program of National Music Theater Network, Inc., a 501(c) (3) not-for-profit organization. NYMF 2009 is presented in association with BroadwayWorld.com, Production Resource Group and TheaterMania.com, and is supported by Back Stage, Barnes & Noble Booksellers, BroadwayBox.com, BroadwayInsider.com, Broadway.TV, Clear Channel Spectacolor, DFD-TV, Frank & Camille's Fine Pianos, King Displays, Manhattan Movement & Arts Center, New World Stages, NASDAQ OMX, Next Magazine, Queerty.com, Reuters, Sweet Caroline's, Tekserve, TheMenEvent.com, The Tank, and Times Square Squared. Major supporters include The ASCAP Foundation, BMI Foundation, Inc., The Nathan Cummings Foundation with the support and encouragement of Jamie Mayer, The Charlie & Jane Fink Charitable Fund, The Rodgers & Hammerstein Foundation, The Shubert Foundation, and The Theater League. NYMF is supported, in part, by an award from the National Endowment for the Arts, and by public funds from the New York City Department of Cultural Affairs and from the New York State Council on the Arts, a state agency. Tickets to individual festival events are now on sale to NYMF Members and will go on sale to the general public on September 1. NYMF Memberships, which combine charitable contributions with valuable, flexible ticket packages and perks like early seating, are currently available for purchase at (212) 352-3101 or www.nymf.org.